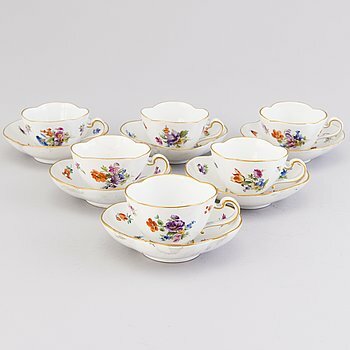 SIX COFFEE CUPS WITH SAUCERS, porcelain, Meissen, 20th century. A set of eight mid 20th century objects for The Finnish State Railways. STEPHAN DAKON, an Goldcheider earthenware figure group, model 6524, Vienna. JOSEF LORENZL, A 'Mary Wigman' earthenware figurine, for Goldscheider, Germany, model 8718. WILHELM KÅGE, A Swedish 'Argenta' stoneware vase, Gustavsberg. A third quarter of the 20th century stoneware vase by Gunnar Nylund for Rörstrand. A porcelain plate, 'Musselmalet, Royal Copenhagen, Denmark, second half of the 20th century. GUNNEL OLIN-GRÖNQVIST och SVEA GRANLUND, a set of twelve porcelain espresso coffee cups and tray for Arabia, Finland. A stoneware 'Argenta' vase and dish by Wilhelm Kåge, Gustavsberg. A stoneware 'Argenta' urn by Wilhelm Kåge, Gustavsberg. A stoneware vase by Stig Lindberg from Gustavsberg, 1954. A faiance dish by Stig Lindberg from Gustavaberg. Four stoneware bowls by Berndt Friberg from Gustavsberg. A stoneware 'Argenta' vase by Wilhelm Kåge from Gustavaberg. A stoneware 'Argenta' vase by Wilhelm Kåge, from Gustavsberg. A stoneware vase by Berndt Friberg, Gustavsberg 1960. A stoneware vase by Stig Lindberg, Gustavsberg, 1967. Twentythree plates and two bowls with Meissen like mark, from around 1900. 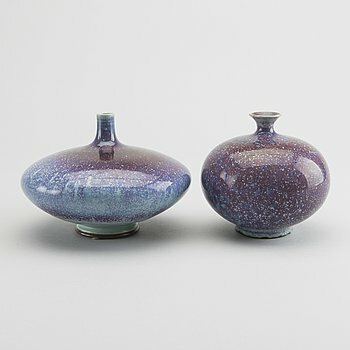 BERNDT FRIBERG, a set of three miniature vases and three bowls, Gustavsberg studio, Sweden 1960's. A large 'Musselmalet' porcelain vase by Royal Copenhagen. 7 empire porcelaine coffee cups, early 19th century. PIERO FORNASETTI, a set of 4 porcelain plates and 6 bowls, Milan, Italy. BERNDT FRIBERG, two stoneware bowls from Gustavsberg studio, signed. FRIEDL HOLZER-KJELLBERG, a rice grain porcelain bowl, Arabia, Finland. A porcelain figurine group circa 1900. A set late 19th century Russian porcelain coffe cups and dishes. A PAIR OF GERMAN URNS, porcelain, Berlin middle of the 19th century. UPSALA EKEBY, a earthenware pot from the 1930's. A French Longwy ceramic bowl, early 20th century. A set of 19 porcelain lithophanes from Plaue, Germany, 19th century. HERTHA BENGTSON, a mid 20th century stoneware floor vase for Rörstrand, Sweden, signed HB. A part 'Ostindia' dinner earthenware service, Rörstrand, first half of the 20th century. A Moomin Characters porcelain mug and a jug from Arabia, Finland, 1995-2005. A 43 piece porcelain service, 'Musselmalet' Royal Copenhagen, Denmark, second half of the 20th century. An European 20th century porcelain figurine. LIISA HALLAMAA, a pair of ceramic candlesticks, signed LH Arabia. FRIEDL HOLZER-KJELLBERG Ceramic Bowl signed ARABIA 1943 - F.H.Kj-. MARGARETA HENNIX, three stoneware wall plates, Gustavsberg. 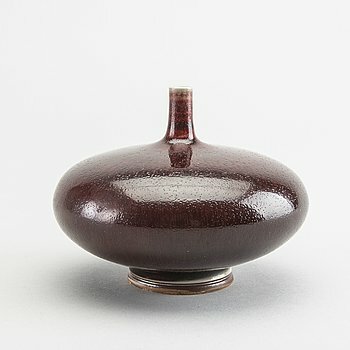 GUNNAR NYLUND, a stoneware vase, Rörstrand 1940's. STIG LINDBERG, a stoneware table lamp. Gustavsberg. HENRIK ALLERT, a stoneware sculpture. Signed. SIGVARD BERNADOTTE, a part "Christineholm"/"Marianne Royal Blue" dinner porcelain service, for Millenium, 2000, (42 pc). SVEN HOFVERBERG, a pair of stoneware table lights. A 45+ 8 pcs Burleigh art deco dinner service. 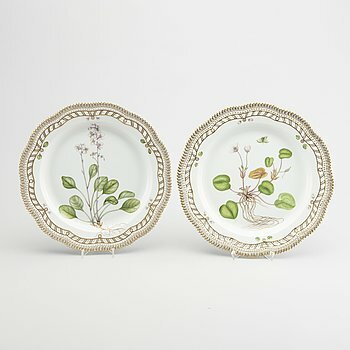 HERTHA BENGTSON, a 50 pcs "blå eld" dinner service. A Darte French porcelain dish, 19th century. WILHELM KÅGE, a set of three vases. A FLOOR VASE IN URBINO STYLE, ITALY, SECOND HALF OF 20TH CENTURY. 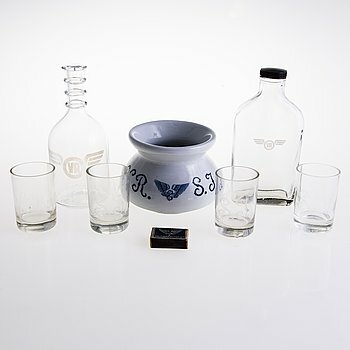 HERTHA BENGTSON, a part coffee service 'Koka Blå', for Rörstrand, mid 20th century (24 pieces). 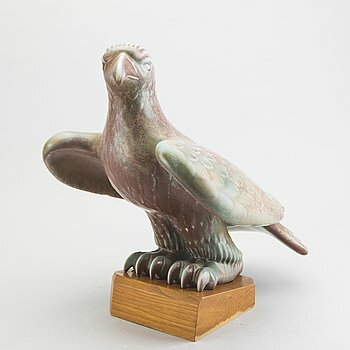 A Wilhelm Kåge 'Argenta' stoneware figure of a dragon, Gustavsberg ca 1940.
a German ceramic pot with 6 cups, second half of the 20th century. BERNDT FRIBERG, 5 miniature stoneware vases/bowls, Gustavsberg. 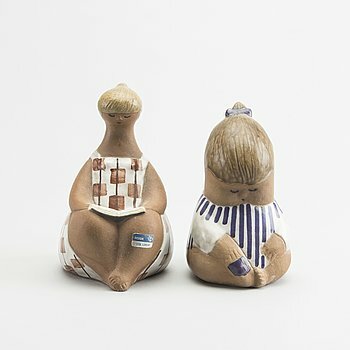 LISA LARSON, a chamotte stoneware figurine, Gustavsberg. STIG LINDBERG, a stoneware wall plaque, Gustavsberg. MARI SIMMULSON, stoneware sculpture, Upsala Ekeby. ERICH OCH INGRID TRILLER, a stoneware vase, Tobo stengodsverkstad, Tobo, Tegelmora, Sweden. A Meissen porcelaine salt cellar/ figurine, first half of the 20th century. STIG LINDBERG, a stoneware wall scone, Gustavsberg. SAMLING stengods, 4 st av Britt Louise Sundell samt Gunnar Nylund. Gustavsberg samt Rörstrand. A Royal Copenhagen Flora Danica porcelain dish. A part service (23 pieces), and a pot, and a pair of dishes, earthenware and porcelain. Sweden, Germany, 20th century. FRIEDL HOLZER-KJELLBERG, a set of six porcelain cups and saucers, a bowl and a vase, Arabia, Finland.Signed F.H.KJ. A set of 7 porcelain lithophanes from Plaue, Germany, 19th century. EVA JANCKE BJÖRK, An earthenware plant pot from Bo Fajans, 1934-43. 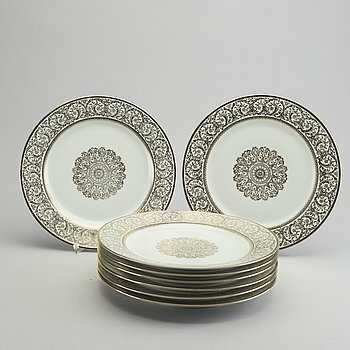 KARIN BJÖRQUIST, A 34-piece set of 'Nobel' bone china dinnerware, Rörstrand, Gustavsberg. Model designed in 1990. MOOMIN-MUG, porcelain, 'Mug green', Arabia Finland 1990-1993. BIRGER KAIPIAINEN, a stonevare dish signed Kaipiainen Arabia. BIRGER KAIPIAINEN, A rimmed stoneware dish signed BK, marked Arabia Made in Finland. HEINI RIITAHUHTA, a porcelain sculpture signed Heini Riitahuhta 2005. BIRGER KAIPIAINEN, a decorative plate, stoneware, signed Kaipiainen Arabia. CARL-HARRY STÅLHANE, a unique stoneware vase, Rörstrand 1960. CARL-HARRY STÅLHANE, a unique stoneware vase, Rörstrand. CARL-HARRY STÅLHANE, 5 unique stoneware vases, Rörstrand. CARL-HARRY STÅLHANE, a unique stoneware vase, Rörstrand 1964. CARL-HARRY STÅLHANE, a unique stoneware vase, Rörstrand 1952. CARL-HARRY STÅLHANE, a unique stoneware stool /sculpture, Rörstrand 1966. CARL-HARRY STÅLHANE, a unique bowl and vase, Rörstrand. 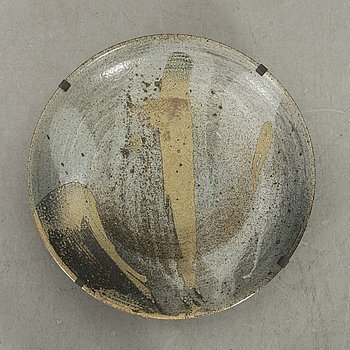 CARL-HARRY STÅLHANE, a unique stoneware bowl with lid, Rörstrand 1961.